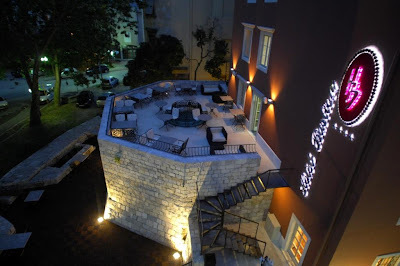 Zadar has been waiting a long time for a city centre hotel and Hotel Bastion appears to be worth the wait. Open in June 2008, the Slovenian architect, Jani Vosel has interpreted the brief of blending the best of old and new with impeccable flair. The four star, boutique hotel has 23 rooms, 4 apartments and a luxury apartment as well as a state of the art video conferencing room, restaurant, bar, small cardio vascular gym, and wellness area. The original stone is featured throughout, particularly in the wellness area, where the end of the stone floor marks the boundary of the 13th century fortress on which the hotel is built. Inside and outside you’ll also find some of the original stone catapault balls used to defend the fortress. The 60 cover restaurant, has a menu based around the freshest of fish – not surprising as the owner, has a fish shop in the market. The menu will change every three months, in tune with the seasons, and the chef is a prodigé of one of the best healthy food restaurants in Croatia – Kukuriku in Rijeka. We're told that the Garden and Arsenal, both innovative venues in their own right, make excellent neighbours and any potential noise problems are mitigated by their skilful sound design and Bastion's double glazing. Bastion also has a ready answer to any parking concerns with 20 dedicated parking spaces just by the hotel. Seems like they have thought about everything. Thanks to Hotel Bastion for today's photo.